Opis: Why does the Crab Nebula still glow? In the year 1054 A.D. a supernova was observed that left a nebula that even today glows brightly in every color possible, across the entire electromagnetic spectrum. At the nebula's center is an ultra-dense neutron star that rotates 30 times a second. 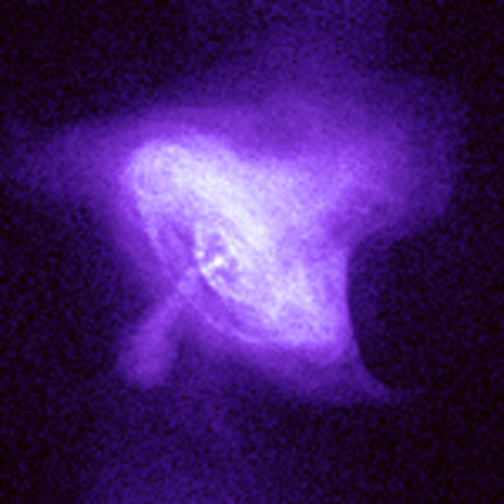 The power liberated as this neutron star slows its rotation matches the power radiated by the Crab Nebula. 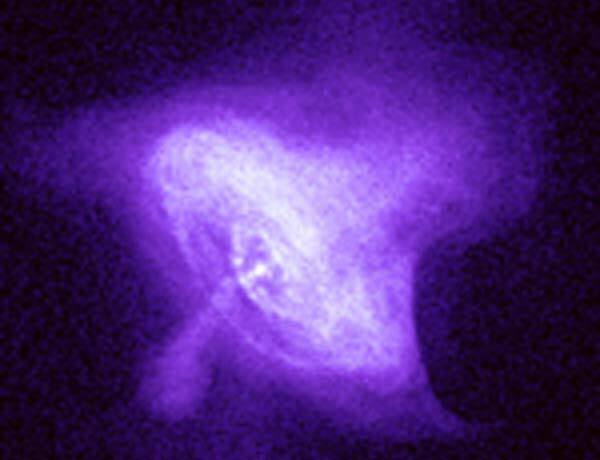 The above picture by the recently launched Chandra X-Ray Observatory shows new details of the nebula's center in X-ray light, yielding important clues to how the neutron star powers the nebula. Visible are rings of high-energy particles that are being flung outward near light-speed from the center, and powerful jets emerging from the poles. Astrophysicists continue to study and learn from this unusual engine which continually transfers 30 million times more power than lightning at nearly perfect efficiency.